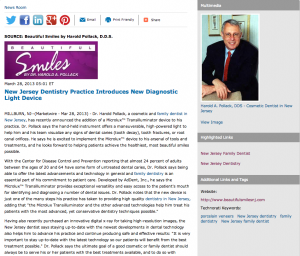 Millburn, NJ — Dr. Harold Pollack, a cosmetic and family dentist in New Jersey, has recently announced the addition of a MicroluxTM Transilluminator device to his practice. Dr. Pollack says the hand-held instrument offers a maneuverable, high-powered light to help him and his team visualize any signs of dental caries (tooth decay), tooth fractures, or root canal orifices. He says he is excited to implement the MicroluxTM device to his arsenal of tools and treatments, and he looks forward to helping patients achieve the healthiest, most beautiful smiles possible. Having also recently purchased an innovative digital x-ray for taking high-resolution images, the New Jersey dentist says staying up-to-date with the newest developments in dental technology also helps him to advance his practice and continue producing safe and effective results: “It is very important to stay up-to-date with the latest technology so our patients will benefit from the best treatment possible.” Dr. Pollack says the ultimate goal of a good cosmetic or family dentist should always be to serve his or her patients with the best treatments available, and to do so with compassion and courtesy. As he continues to pursue the latest techniques and treatments, he adds that ensuring the comfort and satisfaction of his patients remains the cornerstone of his work. Dr. Pollack says he is eager to put the new MicroluxTM device into practice, and hopes to see patients recognize the benefits of modern dental technology as their results continue to improve. As with any dental instrument, he says the MicroluxTM Transilluminator should only be operated by a highly-trained and qualified dentist. Dr. Pollack urges anyone considering dental treatment to consult with a dedicated and experienced practice before undergoing a procedure, regardless of whether they are in need of a reconstructive procedure such as dental implants, or a cosmetic procedure such as porcelain veneers. Located at 280 Millburn Avenue in Millburn, NJ, Dr. Pollack’s practice can be reached at (973) 947-4331. He and his team can also be contacted online via beautifulsmilesnj.com or facebook.com/drharoldpollack.